Would you please get the List of Candidates Shortlisted for Recruitment to the Post of Law Officer Scale-II provided by Jharkhand Gramin Bank? On your reference I will get the Jharkhand Gramin Bank, List of Candidates Shortlisted for Recruitment to the Post of Law Officer Scale-II so that you can check it easily. 1	1885130201	Nitesh Kumar	Unreserved	17.03.2017	10:00 A.M.
Printout of online application submitted while applying for RRBs-CWE-V (conducted in November/December 2016). Printout of IBPS Scores for the stipulated examination. Certificate of Date of Birth as entered in Matriculation/10th Certificate. 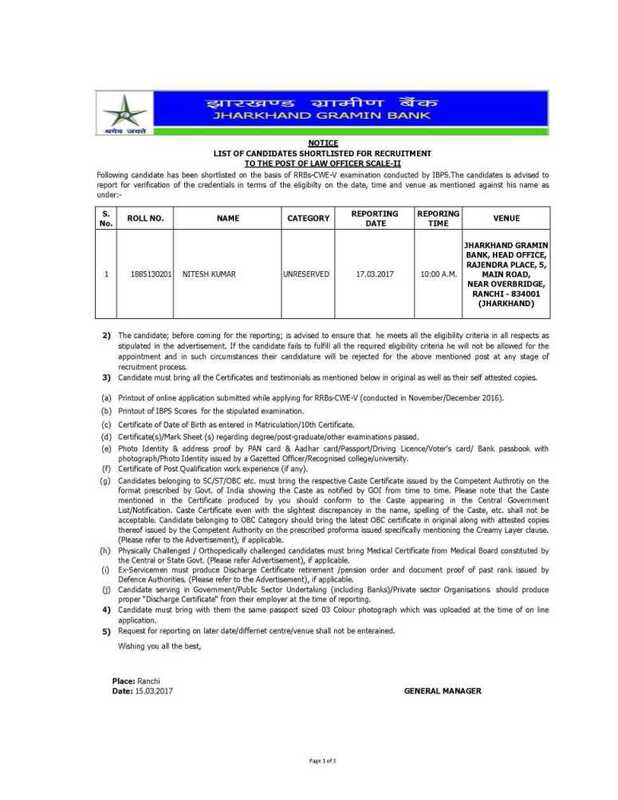 Certificate(s)/Mark Sheet (s) regarding degree/post-graduate/other examinations passed. PhotoIdentity&addressproofbyPANcard&Aadharcard/Passport/DrivingLicence/Voter'scard/Bankpassbookwithphotograph/Photo Identity issued by a Gazetted Officer/Recognised college/university. Certificate of Post Qualification work experience (if any).